I just love giving the dogs large pig leg bones and whole pig skulls. The bones help scrape the plaque off their teeth. Unfortunately, because it's not available here, I have to look for other alternatives. 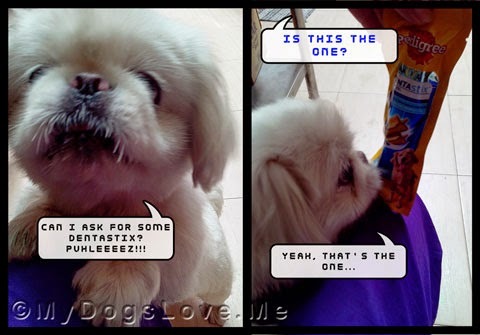 Asti's old owners used to give her Pedigree's Dentastix. I continued doing so. Now that you're in the zone, why don't we start our day by singing the Happy song. 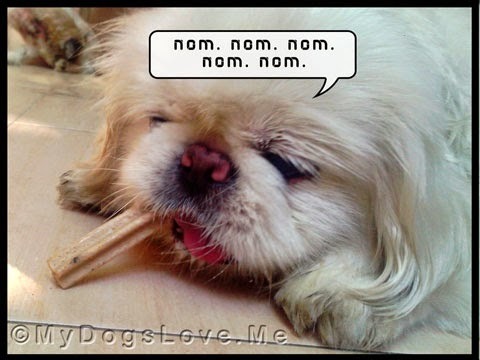 Asti sure did enjoy her Dentastix! We think pig bones would make us HAPPY. We do get beef bones...but pig would be different. We got some dental sticks the other day, but we chomped through them in seconds. So don't think they did any good. oh yes, its so important to have happy teeth! I don't get them too often. Lee likes things that have no preservatives. I got my first fresh pigs ear last month. She got it in Amish county it was still warm when she picked it up.